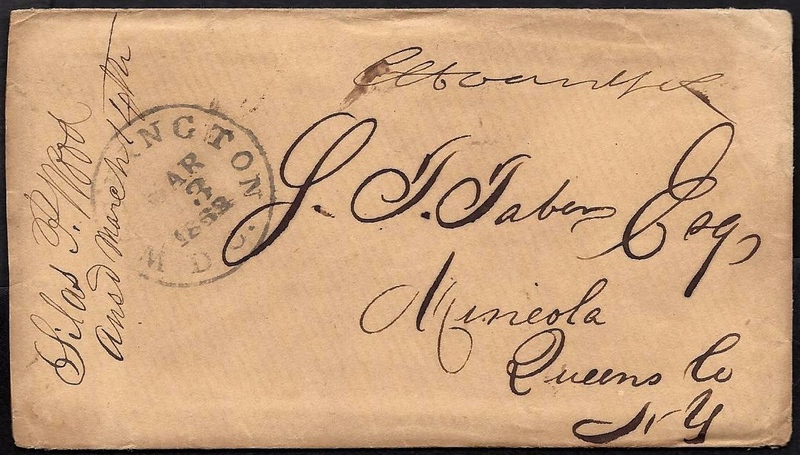 This letter was written by 20 year-old Corp. Silas Payne Wood (1842-1911), the son of Samuel Wood (1804-1881) and (Ruth Pettit) (1804-1885) of Mineola, Queens County, New York. He enlisted in Co. I, 40th New York Infantry (a.k.a. “Mozart Regiment”), in June 1861 and mustered out of the service in December 1862. He claimed to be 24 when he enlisted but other records suggest that he was only 19. Silas married Mary Emma Powell (1842-1909) in July 1865. Later in life, the Woods family lived in Brooklyn where Silas was employed in the Fire Insurance business. Silas wrote the letter to his friend, 15 year-old Samuel T. Taber (1847-1865), the son of Hon. Stephen Titus Taber (1821-1886) and Rosetta M. Townsend (1822-1883). Samuel was drowned at sea while on a voyage from Philadelphia to New Orleans on 21 October 1865. This letter was written from the headquarters of the 40th New York Infantry which was at Camp Sackett in Virginia. Six days later, the 40th sailed from Alexandria for Hampton, Virginia, to participate in the Peninsula Campaign as part of the Third Corps. As the Grand Army of the Potomac is about to make a forward move and that very soon no doubt I will have an opportunity to seek your friend Mrs. Rumsey. ² Fairfax is now in possession of our forces and if such a thing is possible, I will obtain a pass from my Col. ³ and make the attempt at once. The distance is not over 12 or 14 miles and I can make an easy days job of it. The reason I have not mentioned anything in my letters to you concerning her is because “then” I could not “possibly” promise anything of said place. But now as our troops are in possession, I promise you that if it is possible, I will see her and write to you immediately. I expect the Col. will kick against it for it is at least six miles outside of our pickets. The Col. is opposed to giving passes even to Alexandria now as our regiment is liable to move at any moment. If my first plan fails and we march within a dozen miles of Fairfax I will leave the regiment, make the search, and join them at some other point — let the worse come to worse. My punishment would not be very great. If this plan fails, I will try another & another for when I promise a thing, I will not give it up until I’ve made a thorough trial. Editors of papers, “I believe” are now prohibited from publishing anything concerning our armies at present. Night before last Col. [J. H. Hobart] Ward of the 38th [New York Infantry] said that Gen. McClellan was in the vicinity of Centerville and the Rebels were evacuating Manassas. Last night the report “was” that the rebels had fallen back upon Gordonsville. We have been furnished with shelter tents. These tents are all cloth blanks — two joined make a tent for two persons. Everything is ready for the move. We don’t know “when” — it may be the next minute and it might be two weeks from now. It may be at noonday and it may be at midnight. ¹ Charles Henry Van Wyck (1824-1895) was a Representative from New York, a Senator from Nebraska, and a Union Army Brigadier general in the American Civil War. Van Wyck was born in Poughkeepsie, New York. ² I’m not sure who the “Mrs. Rumsey” was that resided in Fairfax, Virginia. There was a Rumsey estate called Mr. Vineyard off Little River Turnpike west of Fairfax during the war. 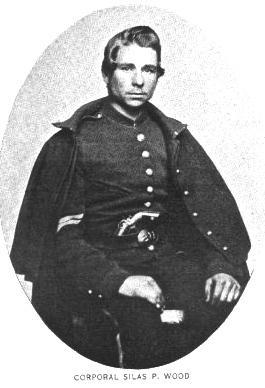 ³ Col. Edward J. Riley led the 40th New York Regiment until just prior to the Battle of Fair Oaks (Seven Pines) on 31 May 1862 when he was seriously injured by a kick on the head from a vicious horse, was thrown from his horse early in the engagement, and injured so as to be compelled to leave the field. On the 4th of June, 1862, he resigned, and Lieutenant Colonel Egan succeeded to the command.